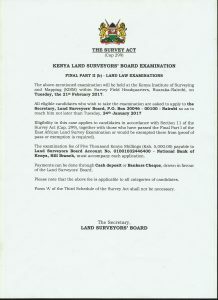 The Land Surveyors Board wishes to inform all eligible candidates that the Land Law Examinations shall be held on Tuesday 21st February 2017 at the Kenya Institute of Surveying (KISM) within the Surveying Field Headquarters, Ruaraka, Nairobi. All eligible candidates are asked to apply to the secretary and to arrange to pay the examination fee of KES. 5,000 before Tuesday 24th January 2017. Please have this in a better resolution. This is currently ilegible.